While in Columbus watching the USA Warriors Hockey team, CPL Jeffrey Laursen introduced my dad to the team coordinator, Lori. 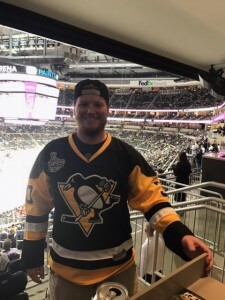 After sharing a little about our mission, she told us about Army SGT Rob Easley, one of the players on the team, who was a die hard Penguins fan that wanted to attend the Wednesday night Blackhawks Vs Penguins game in Pittsburgh. We knew SGT Easley was a HUGE fan because we had the opportunity to host him a few years ago & he drove 4 hours from Walter Reed to attend the game! We told Lori we would do our best to surprise Sgt Easley with tickets to the game & reached out to our friend George. 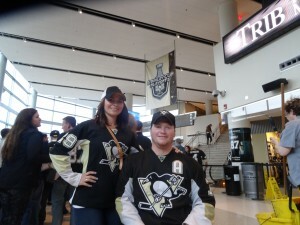 George reached out to his contact at the Penguins & they generously offered tickets to SGT Easley for the game! Needless to say, Rob was excited for the opportunity! He brought his Brother & dad with him to the game. The Penguins went above and beyond by providing tickets in the exclusive Lexus Club! Unfortunately for Rob & the Penguins, they fell behind 4-0 in the first period! They eventually fell to the Blackhawks, losing by the score of 5-1. Despite the score, Sgt Easley had a great time & got to enjoy some good family time together. 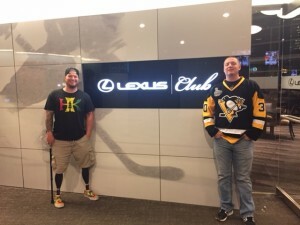 Operation Warrior Wishes would like to send a special thank you to George for getting the ball rolling and to Bob and Jimmy at the Penguins for helping us make this Warrior Wish come true! Most importantly, We want to thank Sgt Easley for his service and sacrifices to our country – it was great to see him up on his prosthetics this time, after attending in his wheelchair a couple yrs ago! Thank you for never giving up & being an inspiration Rob!